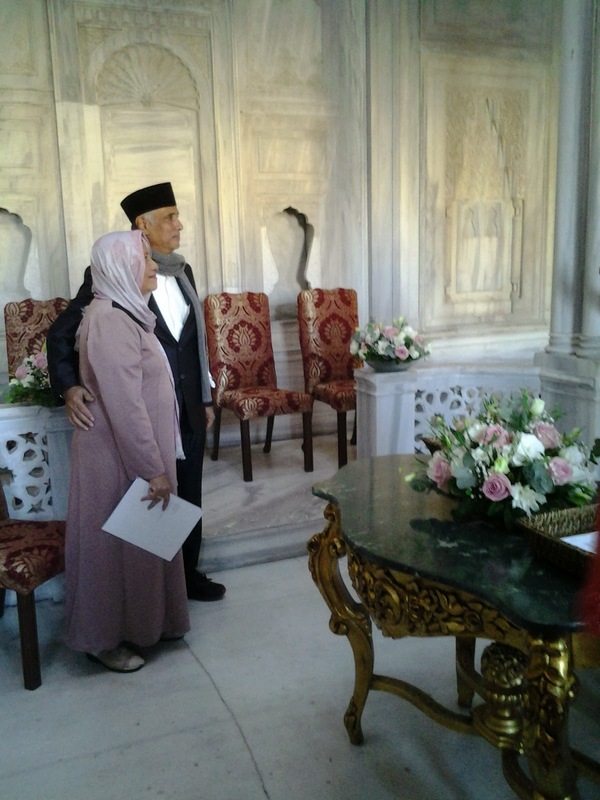 I never heard about this Çırağan Palace till my sister decided to get married here. You can read about the palace here or here. The palace is closed for public and the chances to visit it when one invites you to their wedding party conducted here. It is actually just few minutes by walk from the famous Dolmabahçe palace - Besiktas Area. Let's say, yes I have the privilege to enter the palace couple of times. First, when my sister and I visited the venue to arrange things and second was during the party. The palace indeed is beautiful. The staff are amazing. We have to walk from the hotel lobby (Kempinski) through corridor, stairs and lift to finally reach it. Of course they have specific door to enter the palace direct and I assume it is open when a party is conducted here. The venue does cater for hundreds of people but with my sister, it was only less than 20. What? less than 20? Yes, we never dream any big parties, we like a small and sacred one. Since the party, well actually it was not a party, it was just a wedding ceremony that is taken place here, later in the evening we had family dinner somewhere else. They only booked the place from 2 - 5 pm, that is why only light snacks were served. My sister once told me how hard it was to reserve the place since only few people attending and December was not the month where people have wedding party in Istanbul. The palace was taken care in a strict proper action. When we came a week before, no heater is used here, it was totally cold specially with marbles covering the wall. The staff told us that the heater would be switched on a day before the party. Back to the light snacks which are not that light according to me,:). They provide tens of selections for each hot and cold where one can choose 8 different selection (well, at that time, the staff was kind enough to let my sister chose 9, thank you). Besides, different kind of nuts were also served and unlimited tea, coffee, fresh juices (that I skipped for no reasons) and water. Not to mention, a wedding cake was also served. 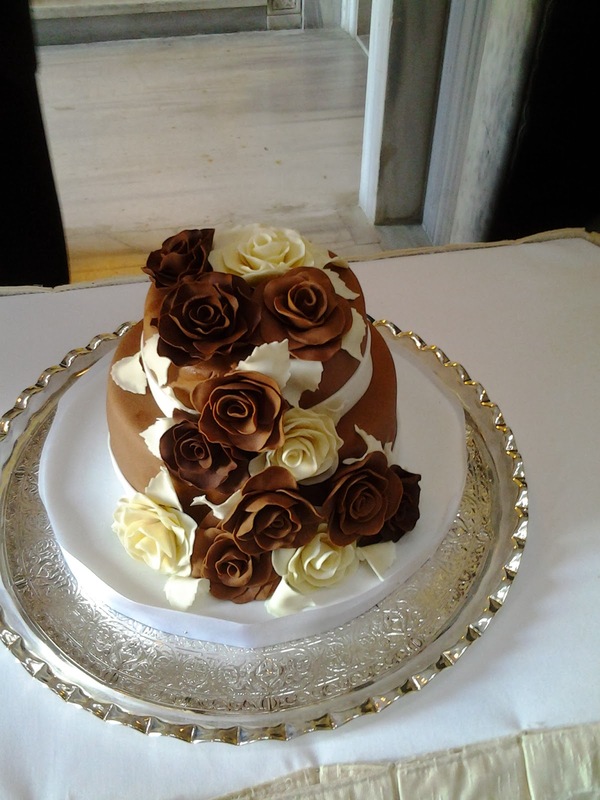 As per my brother in law's request, it was chocolate cake covered with not that sweet fondant and decorated perfectly. Disclaimer : some pictures belong to my sister's brother in law and my (late) uncle. Thank you for sharing your experience of having a small wedding at Ciragan and the beautiful photos! My husband (who is Turkish) & I would love to celebrate our small anniversary party but all I could find was for 100's of people. Your post has been very helpful. Now we need to email them for pricing.